SqueakyChu: Both books are extremely well written, nicely plotted gothic mysteries. Johanna11: Because it is mentioned in the book and will help you understand how David felt. Beset with increasingly debilitating headaches, fledgling author David Martín learns from his physician that he suffers from a brain tumor and the prognosis isn't promising. Soon after, he is approached by a mysterious stranger who offers him a large sum of money and a clean bill of health in exchange for writing an influential religious book. David agrees, though the further he becomes entangled in his boss' wishes, the greater his misgivings. UPDATE 10/25/2017 - Reread this book for the third time. I'm still in awe. I love this book so much!!! The Angel’s Game is the second book in The Cemetery of Forgotten Books series, but it follows events that took place before The Shadow of the Wind happens. I have been so excited to get back into this interesting world and learn about Barcelona before David Sempere was born into it. While I don’t think that this book quite captures the magic of The Shadow of the Wind, it’s still interesting, and has plenty of drama and intrigue to keep you going. Unsurprisingly, this book centers on the power of words and stories; the main character, David Martin, is a pulp fiction writer, and dreams of becoming an author in his own right someday. After ghostwriting a successful story, a mysterious man offers a huge publishing contract for him to write a book about religion; however, David has no idea just what he’s agreed to until too late. I had a bit of a hard time getting into this book. First, it’s rather depressing, so you have to be in the right mindset to take it all in. A lot of the story hinges on gloom and unhappiness, so definitely be prepared for that. This isn’t light, fun reading. There’s a real melancholy air hovering over the story. It also takes a while to set the scene and get everything in place before it ramps up. But, when it gets going, it doesn’t stop. I zoomed through the last hundred pages or so, because I just couldn’t put the book down. There was too much going on and everything was high-energy, so I just kept turning those pages. There’s equal amounts of fantasy and mystery, with touches of romance too. The plot was super interesting, and once the whole of the story is revealed, it’s very good. I liked that Zafon dropped a few familiar things from The Shadow of the Wind, but you absolutely don’t need to read that book before reading this; they are completely independent stories. I have a personal like for reading things in chronological order, so if I’d known about this book before I read The Shadow of the Wind, I think I would have enjoyed it more to read The Angel’s Game first, but alas. If you liked The Shadow of the Wind, I think you’ll also like this, but it’s definitely a different sort of story, and like I said earlier, just not quite as magical. It gave me some new appreciation for the first book, and I want to re-read it now after reading this, but I’ll hold off until I read the third book. If you’re interested in Gothic novels, and love some dark intrigue and mystery with a bit of magical realism thrown in, definitely check this out. But while the plot payoff may not be what readers are expecting, the novel itself is such a pleasure to read that the characters could have ended with a rendition of "The Sun Will Come Out Tomorrow," played on cowbells and a zither, and I would have shrugged it off. “Faust” this isn’t. Ruiz Zafón’s flamboyant pulp epic is something altogether sillier, a pact-with-the-devil tale whose only purpose is to give its readers some small intimation of the darker pleasures of the literary arts, the weird thrill of storytelling without conscience. Game is a multi-layered confection that combines undying love, magical realism, meditations on religion, the importance of books and a love affair with the vibrant city of Barcelona. Zafon hits the reset button on what it means to be a great writer. His visionary storytelling prowess is a genre unto itself. While much of this novel is highly enjoyable, at some latter point the tongue withdraws from the cheek. In wrapping up a host of absurd sub-plots, somewhere in there the writer loses his sense of humour. When the book ceases to be self-conscious about its own manipulations, it stops being fun. This won’t bother some readers; some will happily dive into the mysticism up to the neck. But others will miss the drollery and sophistication with which the novel began, and for these readers Zafón’s straight resolution will disappoint. Zafon delivers a warning about the dangers of obsession, mixed with an obvious passion for literature and the printed word; his book is also a song of love for Barcelona with all its creaking floorboards and hidden subbasements. Zafóns novel is detailed and vivid, and Davids narration is charming and funny, but suspect. Villain or victim, he is the hero of and the guide to this dark labyrinth that, by masterful design, remains thrilling and bewildering. Once again, Zafon proves himself a magician, vividly invoking bygone Barcelona while unscrolling a byzantine plot at breakneck pace. The crumbling houses, supernatural secrets, and emotionally responsive weather might be a bit much for some readers to digest, though for others it will be a feast. But what would have kept The Angel's Game itself from being someday consigned to the Cemetery of Forgotten Books would have been a stronger connection between storybook evil and the real-life kind. While Zafon portrays Martin as a successful seller of entertainments who longs to be a serious scribe, his own unfinished thoughts about religion and totalitarianism show his priorities. Pity, because he seems the perfect author to help prove that serious stuff can also be entertaining as hell. It is part of our nature to survive. Faith is an instinctive response to aspects of existence that we cannot explain by any other means, be it the moral void we perceive in the universe, the certainty of death, the mystery of the origin of things, the meanings of our lives, or the absence of meaning. These are the basic and extremely simple aspects of existence, but our limitations prevent us from responding in an unequivocal way and for that reason we generate an emotional response, as a defense mechanism. It's pure biology. An intellectual is usually someone who isn't exactly distinguished by his intellect. He claims that label to compensate for his inadequacies. It's as old as that saying: Tell me what you boast of and I'll tell you what you lack. Our daily bread. The incompetent always present themselves as experts, the cruel as pious, sinners as devout, usurers as benefactors, the small-minded as the patriots, the arrogant as the humble, the vulgar as elegant, and the feeble-minded as intellectual. I'm staying here to read. Life's too short. Silence makes even idiots seem wise for a minute. Most people, as they grow old, continue to believe in nonsense, usually even greater nonsense. I swim against the tide because I like to annoy. "Everything we need to know is written in the great book of nature," Corelli agreed. "We only need the courage and the mental and spiritual clarity with which to read it." These pages will be our memory until she draws her last breath in my arms and I take her with me to the open sea, where the deep currents flow, to sink with her forever, and escape at last to a place where neither heaven nor hell will ever be able to find us. Na Barcelona turbulenta dos anos 20, um jovem escritor obcecado com um amor impossível recebe de um misterioso editor a proposta para escrever um livro como nunca existiu a troco de uma fortuna e, talvez, muito mais. Com deslumbrante estilo e impecável precisão narrativa, o autor de A Sombra do Vento transporta-nos de novo para a Barcelona do Cemitério dos Livros Esquecidos, para nos oferecer uma aventura de intriga, romance e tragédia, através de um labirinto de segredos onde o fascínio pelos livros, a paixão e a amizade se conjugam num relato magistral. Years ago, when I began working on my fifth novel, The Shadow of the Wind, I started toying around with the idea of creating a fictional universe that would be articulated through four interconnected stories in which we would meet some of the same characters at different times in their lives, and see them from different perspectives where many plots and subplots would tie around in knots for the reader to untie. It sounds somewhat pretentious, but my idea was to add a twist to the story and provide the reader with what I hoped would be a stimulating and playful reading experience. Since these books were, in part, about the world of literature, books, reading and language, I thought it would be interesting to use the different novels to explore those themes through different angles and to add new layers to the meaning of the stories. It all sounds very complicated, but it is not. At the end of the day, these are just stories that share a universe, a tone and some central themes and characters. You don’t need to care or know about any of this stuff to enjoy them. One of the fun things about this process was it allowed me to give each book a different personality. Thus, if Shadow of the Wind is the nice, good girl in the family, The Angel’s Game would be the wicked gothic stepsister. Some readers often ask me if The Angel’s Game is a prequel or a sequel. The answer is: none of these things, and all of the above. Essentially The Angel’s Game is a new book, a stand-alone story that you can fully enjoy and understand on its own. But if you have already read The Shadow of the Wind, or you decide to read it afterwards, you’ll find new meanings and connections that I hope will enhance your experience with these characters and their adventures. 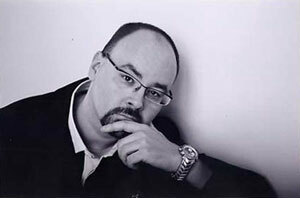 Carlos Ruiz Zafón's book The Angel's Game was available from LibraryThing Early Reviewers.